J. A. Happ is a 6-foot-6 left-handed pitcher with the Phillies in Clearwater, FL, providing an inside view of what it is like to be in a Major League Spring Training camp for the first time. The phrase "never let yourself get too high or too low" keeps running through my head. It is a common baseball phrase explaining that when things are going good you shouldn’t pat yourself on the back too much and when things aren’t going your way you can’t get down on yourself for long. I was given the opportunity to start a game on Monday. It was an experience that I will not forget for a few reasons. The first reason is the feeling I had leading the team onto the field to start the game. I cannot wait to experience that again. Another reason I won’t forget that start are the results of the game and what caused them. It was a learning experience that I think will help me in the future. Things are still exciting in camp. We are pretty much set in our routines now that games have started but there are a few things that break any monotony. There are some very enticing bunting games that go on as well as a sometimes painful PFP (pitchers fielding practice) practice that help keep things loose. The painful part comes into play when every so often instead of using regular baseballs we use softer balls and they are hit about as hard as Pitching Coach Rich Dubee possibly can at us. He gets a kick out of that. We, however, don’t enjoy it quite as much as he does but it can be very funny as long as it’s not my turn. This is my first Major League Spring Training so I may just be caught up in the excitement, but I don?t think it?s just me. 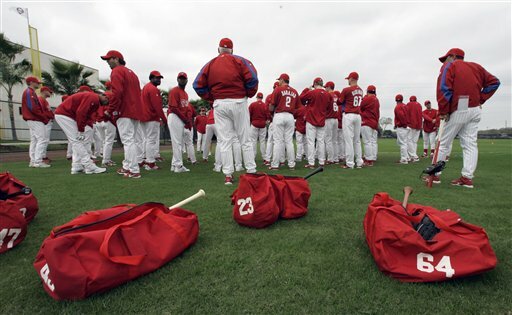 There is something special about the 2007 Phillies. We are only a few days into Spring Training and it is clear. I?m sure every other club has their talks and meetings to start the things off at camp. I?m also certain that every other club sets goals, most importantly winning a World Series ring. At the same time I am also confident that, although the statements are made, no one else delivers them the way Charlie Manuel does. His delivery is unique to say the least but his points are clear. He has us feeling motivated and excited and at the same time laughing out loud. I have been excited to be here since I received word that I was invited to Major League Spring Training back in December. The thing I was looking forward to the most is meeting and playing with this type of competition. It is special to see how all of these superstars go about their business. They really seem to have a good time doing it. There are a few guys here with nearly twenty years experience in the Major Leagues. You cannot help but respect the way they go about their routines and get themselves ready physically and mentally to get after it for another season. I am excited to see where I stand among all these players. We are starting to throw batting practice now and I had my first session throwing to hitters yesterday. It was a lot of fun getting up there and seeing these guys stepping up to the plate. Soon we will be throwing without the L screens in front of the mounds and then getting into games shortly after that. My main focus is on staying healthy and trying to take advantage of any opportunities to gain experience or gain new insight. So far things have been great.